Here’s a treat for all you Starbucks lovers out there! 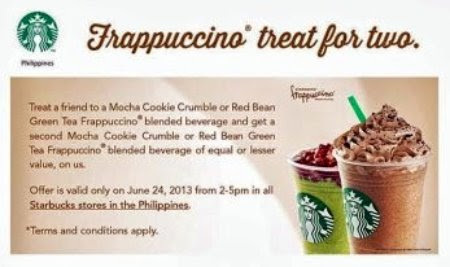 On 24 June, 2013 from 2-5pm, Starbucks is giving you a chance to treat your friend to a Mocha Cookie Crumble or Red Bean Green Tea Frappucino blended beverage and get a second cup for free! All you have to do is save and print this voucher and show it to your favorite Starbucks barista to get your blended beverage for free. You also have the option to show this voucher through your mobile device. The voucher may be used to buy 2 featured blended beverage and avail of 2 free drinks. So save the date and do not forget to get your free drink. This entry was posted in free grub and tagged beverages, Starbucks on 19.June.2013 by admin.